Hooray! Christmas is almost here! I hope you are taking some time to relax and make new Christmas memories with those you love. If you wanted something easy, fun and perdy to make for Christmas – try this Birds Milk Jello recipe. 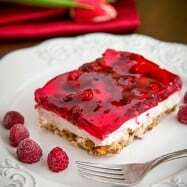 It’s Vera’s famous ptichiye moloko recipe (bird’s milk); a layer of creamy mouse topped with raspberry jello (don’t worry, I’m wrapping up my bird’s milk spree). I hope you enjoy this super easy and fancy dessert. You can easily double it for a potluck. I’ll have some exciting new Russian recipes for New Year’s so stay tuned! 1. 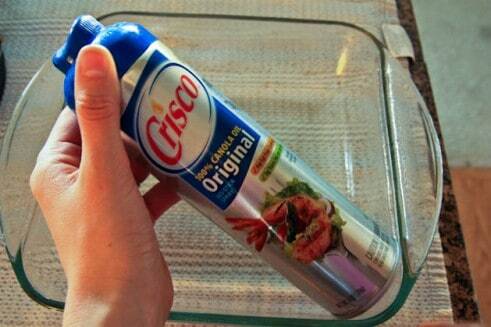 Spray a 8×8-inch glass baking dish with cooking spray. This keeps the jello from sticking to the pan when serving. 2. In a small pan, whisk together 1 packet unflavored gelatin with 1/2 cup milk over medium heat. 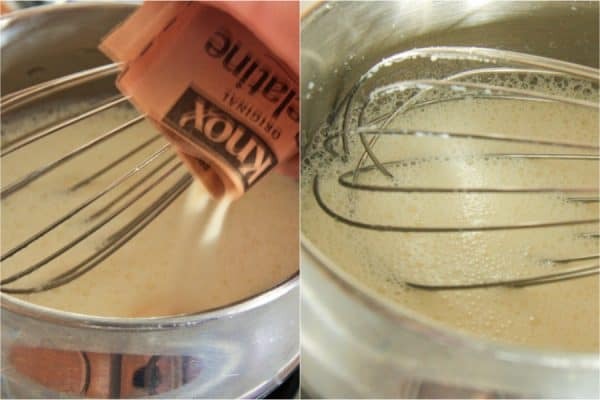 Continue whisking until it just begins to steam, remove from heat (DO NOT BOIL). Set aside to cool. 3. In the bowl of an electric mixer over medium speed, whisk together 1/2 cup sugar, 8 oz tub of sour cream and a 8 oz tub of cool whip until well blended. Make sure your cool whip is fully thawed and soft or you will have clumps in your jello. 4. With the mixer on medium speed, slowly add the warm milk mixture until incorporated. 5. Immediately pour half of the cream into the prepared baking dish. Smooth the top. 6. Mix red food coloring (a few drops at a time until desired color is reached) into the second half of the cream until well-blended. 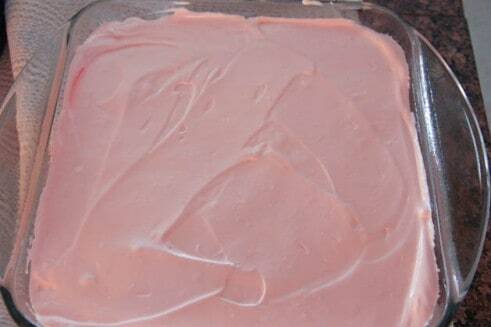 Quickly spread pink jello over your white cream. Refrigerate for at least 30 minutes. 7. Dissolve jello with 2 cups boiling hot water and set aside to cool to room temperature. 8. Once jello is cool or just luke-warm, pour the raspberry jello over the bird’s milk. You can also add fruit over the top after you pour your jello. Try raspberries or sliced strawberries for an extra tang. 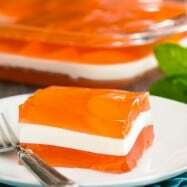 Refrigerate jello 2-4 hours, or until jello is set. Have fun with it. Make it unique by adding any kind of jello or food coloring. Spray a 8x8-inch glass baking dish with cooking spray. This keeps the jello from sticking to the pan when serving. In a small pan, whisk together 1 packet unflavored gelatin with 1/2 cup milk over medium heat. Continue whisking until it just begins to steam, remove from heat (DO NOT BOIL). Set aside to cool. In the bowl of an electric mixer over medium speed, whisk together 1/2 cup sugar, 8 oz tub of sour cream and a 8 oz tub of cool whip until well blended. Make sure your cool whip is fully thawed and soft or you will have clumps in your jello. With the mixer on medium speed, slowly add the warm milk mixture. 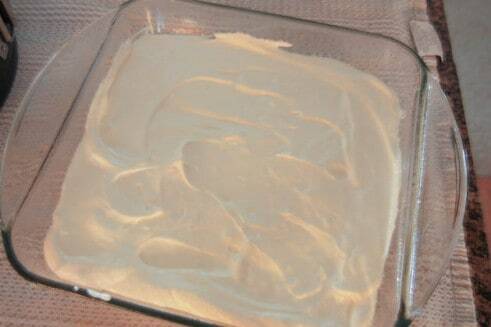 Immediately pour half of the cream into the prepared baking dish. Smooth the top. Mix red food coloring (a few drops at a time until desired color is reached) into the second half of the cream until well-blended. 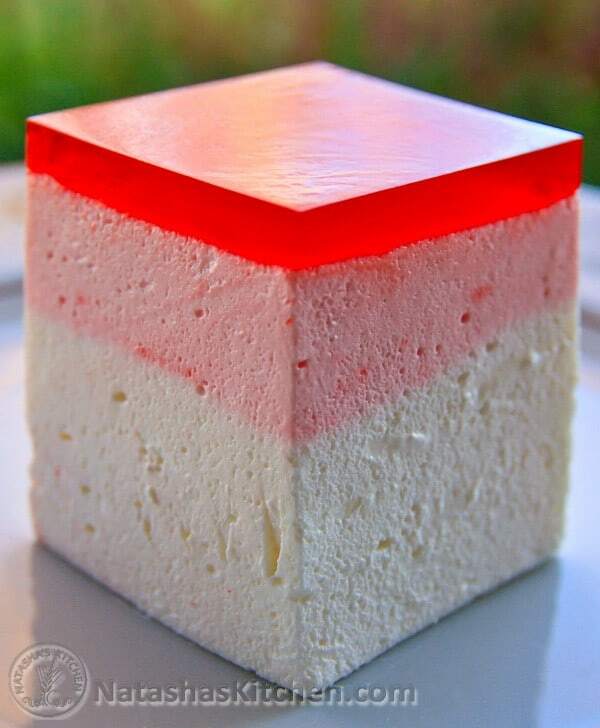 Quickly spread pink jello over your white cream. Refrigerate for at least 30 minutes. Dissolve jello with 2 cups boiling hot water and set aside to cool to room temperature. Once jello is cool or just luke-warm, pour the raspberry jello over the bird's milk. You can also add fruit over the top after you pour your jello. Try raspberries or sliced strawberries for an extra tang. 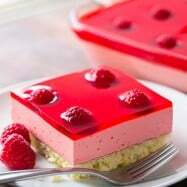 Refrigerate jello 2-4 hours, or until jello is set. Have fun with it. Make it unique by adding any kind of jello or food coloring. 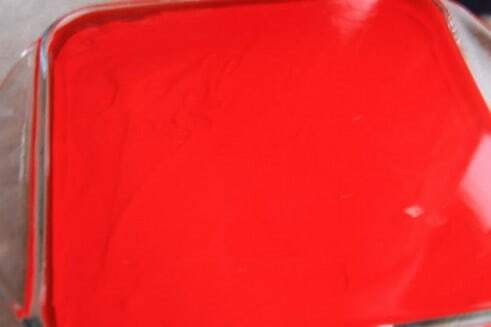 Intruction 6: Mix red food coloring into the second half of the cream until well-blended. Quickly spread pink jello over your white cream. Refrigerate for at least 30 minutes. I made this recipe the day before, and while I was whisking the birds milk together, I tasted it and was worried that the dish would come out tasting like sweetened sour cream. After pouring over the cool jello over the birds milk, I noticed that the jello liquid sank to the bottom!!! I was saddened and wondered how this was going to turn out. The next day I pulled it out of the refrigerator and cut a slice. Fortunately I realized that the jello formed a perfect thick layer, although in the bottom, and when I tasted the birds milk, the deliciousness was beyond what I ever expected!!! Will make this recipe more often!! Now I can’t wait to try the birds milk cake!!! 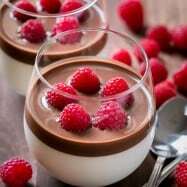 I really want to make this recipe but we don’t have any cool whip where I live, how can I replace it? Plus- what is the size of the gelatin packet you are referring to? I need to check that ours are the same. I’ve tried this recipe for some reason it doesn’t have the nice height like yours does. mine is somewhat flat. When I mixed the warm milk mix into the sour cream mixture, It was kind of runny, not enough to “spread” out, do you know what might have happened? Thanks for having this blog and for sharing your recipes! 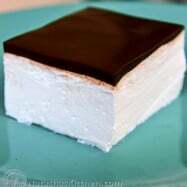 I love ptichiye moloko and would really like to try making this dessert. I’ve moved to Australia, and unfortunately we don’t have some basic items that are found in US, and one of them is cool whip. I’ve heard that you can beat heavy cream to get that fluffy consistency…is that true? Thank you so much!! I’ll definitely try that! Hi I am wondering if there are recipes in Russian laungage?? where do u live? if in NYC, there are at least 2 kosher companies out there now, but u need to look in kosher supermarkets. this is one http://www.koshergelatin.com/ and i saw another one – from israel. 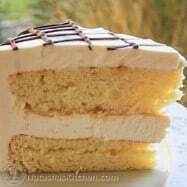 Natasha – ur recipes are awesome!! can’t wait to make them for my russian friends – they’ll be delighted!